Place steak and onion in resealable food storage plastic bag. In small bowl, combine lime juice, tequila, oil, garlic, chili powder, cumin and salt; mix well. Pour over steak and onion in bag. Seal bag; turn bag to distribute marinade. Refrigerate 3 hours, turning occasionally. Heat 12-inch nonstick skillet over high heat until hot. Add steak, onion and all of marinade. Add bell peppers; cook and stir until beef is no longer pink, bell peppers and onion are crisp-tender and most of liquid has evaporated. Place bun halves, cut side up, on ungreased cookie sheet; broil 4 to 6 inches from heat for 1 to 2 minutes or until toasted. Spoon beef and vegetables onto bottom halves of buns. Top each with 2 pices of cheese; return to broiler for 1 minute to melt cheese. Cover with tops of buns. If desired, top with salsa, sour cream or guacamole. Served in a bun instead of a tortilla, this sandwich features favorite fajita ingredients. 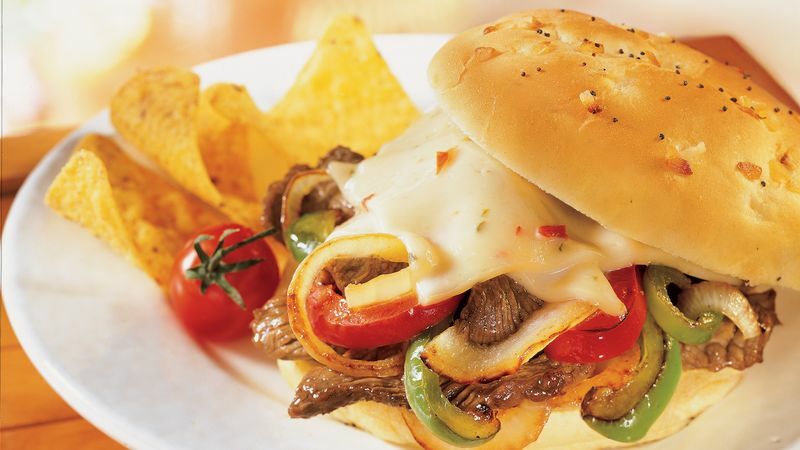 For added flavor, we’ve topped the sandwich with hot pepper Monterey Jack cheese. Either regular or gold tequila can be used in the marinade. The sandwich filling can be served in warm flour tortillas instead of on sandwich buns. For easy slicing, partially freeze the meat. If you’re starting with frozen meat, partially thaw it before slicing.